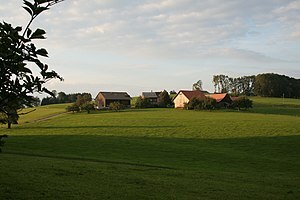 A hamlet is a small settlement, smaller than a village. Usually, all settlers in a hamlet are centered around a single economic activity. A hamlet may consist of a farm, a mill, a mine or a harbor. All the people living there would be workers on that farm, mill, mine or harbour. Hamlets, especially those with a medieval church may have resulted from a medieval village, that was abandoned for some reason. Because of the small size of the settlement, there are usually no buildings which have a central or admninistratrive function. There usually is no church, town hall or pub. Roads and streets in the hamlet do not have names, most of the time.5-6 families may live there usually within a 2km radius area. This page was last changed on 16 November 2017, at 11:43.